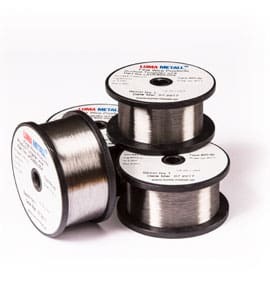 Luma fine tungsten wire is used in a various number of applications where precision wire is needed. Tungsten, also known as wolfram, is a chemical element with the chemical symbol W and atomic number 74. The name tungsten comes from the Swedish language where “tung” means heavy and “sten” means rock. We use tungsten for manufacturing of fine tungsten wire which is a precision wire. Tungsten is remarkable for its robustness, especially the fact that it has the highest melting point of all metals and the highest tensile strength. That makes fine tungsten wire very effective. Also remarkable is its high density of 19.3 times that of water, comparable to that of uranium and gold. This high density also means a high absorption capacity for radioactive radiation and X-rays. Tungsten has the lowest vapour pressure and the lowest coefficient of thermal expansion of all metals in pure form. The electrical conductivity is good, about 30% of copper, as well as the thermal conductivity, which is about 43% that of copper. Tungsten has the lowest coefficient of thermal expansion, and at temperatures above 1650 °C the highest tensile strength of all metals. Tungsten has unusually low specific heat, which combined with the good thermal conductivity means that the metal heats up and cools down very quickly. That is a benefit with a fine tungsten wire. Chemically, tungsten is not particularly reactive. At room temperature, it is resistant to air and water and is attacked only slowly by acids, aqua regia or alkalis. A mixture of hydrofluoric acid and nitric acid solution dissolve the metal easily already at ordinary temperature. At 400-500 °C, tungsten is oxidized in the air, and at 800 °C this attack is very rapid. The unique characteristics of our fine tungsten wire enable us to offer a high quality precision wire. For example this means that our precision wire is available in wire sizes as fine as 4 micron (0.00016”).